Last week, the CANA Foundation joined Morning Joe’s, led by co-host Mika Brzezinski, to discuss how the Trump budget would affect wild horses. The appearance was part of a major publicity campaign to raise awareness of a key vote by the Senate Appropriations Committee that could reopen the door to allow horse slaughter in the United States. CANA Foundation’s campaign involves the purchase of several high-visibility billboards in New York City’s Times Square and the formation of a coalition of animal, environmental and health organizations from New York, called New Yorkers Against Horse Slaughter. CANA Foundation is also organizing a nationwide unification of pro-horse organizations to put pressure on key committee members. With dangerous language quietly inserted into the U.S. House’s massive spending bill that puts over 80,000 healthy wild horses at risk for slaughter, the last line of defense is ensuring that the Unites States Senate does not allow this dangerous language to become part of the final appropriations bill when the Senate and House go into conference. CANA Foundation President Manda Kalimian and Relations Director Moses Brings Plenty joined Morning Joe to make the case for why this proposal to rescind the ban on horse slaughter cannot be allowed to be included in the final budget. CANA Foundation, The Cloud Foundation, Wild Horse Freedom Federation, Equine Advocates, American Wild Horse Campaign, Equine Welfare Alliance, In Defense of Animals, Wild Equid League of Colorado, American Horse Rescue Network, Vickery Eckhoff (Journalist & Screenwriter), Mobilization for Animals and Pine Nut Wild Horse Advocates. 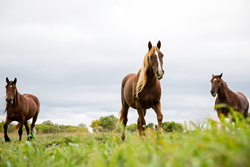 The CANA Foundation is a New York-based organization that rescues, rewilds, and rehomes wild horses and has traveled around the country to protect horses in 12 western states. The organization has also worked right at the roots with sovereign tribal communities to rehome horses on native lands, often as part of youth programs. CANA initiatives work towards long-term, sustainable solutions of managing and preserving our wild horse populations, while promoting community empowerment and environmental sustainability for today and tomorrow.